Home Archive by category "Female Empowerment"
Female success is often hard won and so the cause for pride is even greater – but whilst we can see International Women’s Day as a time to admire how far we’ve come; we also need to think about how far we have to go. I have one resolution for 2019. I’m going to be period positive. I’m going to champion periods all year long. Hopefully I’ll convince you to join me. 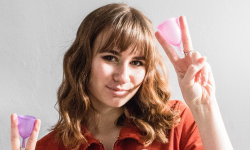 As Valentine’s Day approaches – is it ever a good idea to gift your partner a menstrual cup for the big day? Volunteer Katrina finds out! We’re so excited to announce that Bronte Huskinson a.k.a. Bookish Bronte is joining The Cup Effect as one of our Ambassadors. Bronte is an Instagrammer, writer and period campaigner who we’re delighted to have on board as we gear up for what’s set to be the biggest year for The Cup Effect yet!